28 October 2014, at 9:43a.m. 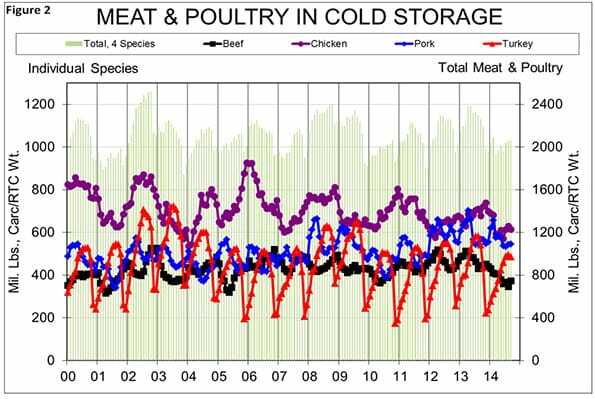 US - With meat and poultry prices at or near record highs, it should be no surprise that freezer inventories remain low, writes Steve Meyer for the National Hog Farmer. But did the low stocks cause the high prices or did the high prices encourage stock holders to sell when the selling is good? The answer in typical economist-ese is “Both!” As with many things in economics, the causal factors are not easy to separate. Many variables are determined simultaneously with complex feedback loops in the marketplace, only a few of which may be observed by individual agents. 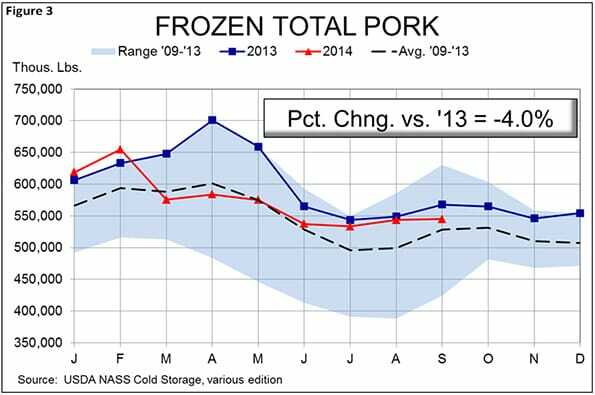 Figure 1, though, shows that freezer stocks have been low by historic standards all year. We refer to “historic” in a bit of a short-term manner there as we are judging today’s numbers against just the past five years. While the time period is short, note that last year’s freezer inventories set the highs for that time period so the reductions this year are large. 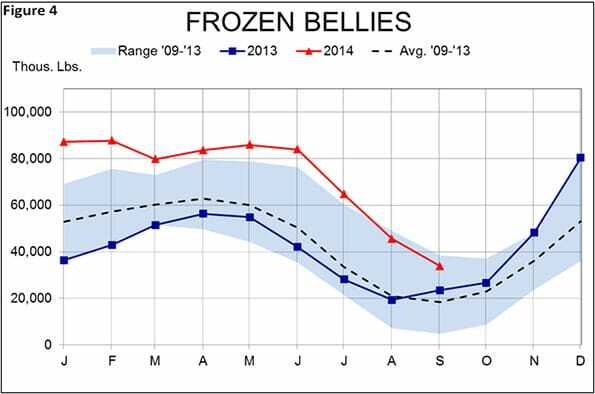 Total freezer stocks of the four major species have been down more than 10 per cent, year-on-year, in six months so far in 2014 with the largest such decline being 17.6 per cent in April. Four-species stocks stood at 2.23 billion pounds on Sept. 30, 9.6 per cent lower than one year ago. The 2009-13 time period is, in my opinion, much more relevant than more distant history because so many factors have changed. Total output levels increased steadily through 2008 suggesting that cold storage stocks probably should have increased along with them. Figure 2 shows that, except for a chicken-driven surge in 2002, these stocks peaked in 2008 and have declined since. The fact that turkey drives the seasonal increases in the four-species number is clear but the peak for turkey stocks is behind us and the 2014 peak will be the lowest on record. Profits in the turkey sector will almost certainly drive expansion but I expect that expansion to be in the more seasonally steady processed turkey and turkey parts sectors and not in the whole bird sector which usually drives these seasonal increases. Pork inventories on 30 September amounted to 546 million pounds, down four per cent from last year but 3.1 per cent higher than the five-year average. After two months near the top of that range, September’s figure strikes me as pretty normal for this time of year. Pork inventories so far this year had been dominated by bellies, whose stocks were more than double 2013 levels at the ends of July and August. See Figure 4. Bellies stocks remain large (plus-44 per cent) relative to last year but are less than half their huge levels of January through July and are now back in the five-year range. Those early year stocks, of course, were driven by processors’ recollections of basically running out of bellies during the summer of 2013. The species with the tightest frozen inventory situation as of 30 September, though, was beef. 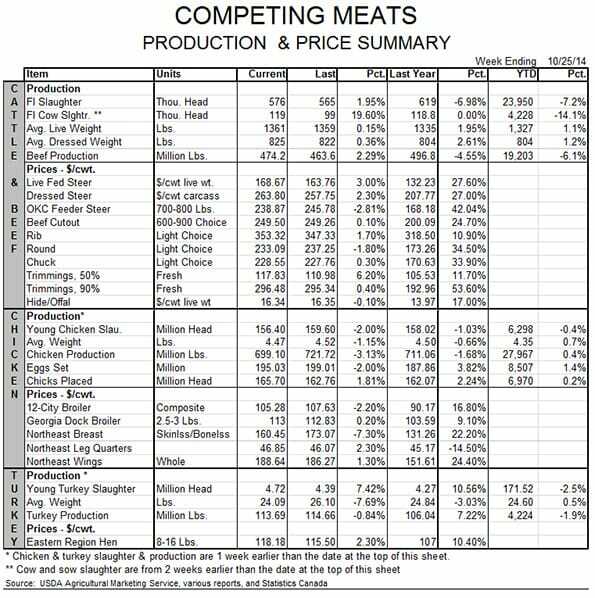 Lower fed cattle slaughter (down 4.7 per cent year-to-date versus 2013) and extremely low cow slaughter totals (just 102,000 head the week of 14 October, 14.1 per cent lower than last year with the year-to-date total also down 14.1 per cent) have left beef stocks very tight. The 373.3 million pounds in freezers on 30 September was 16 per cent less than one year ago. 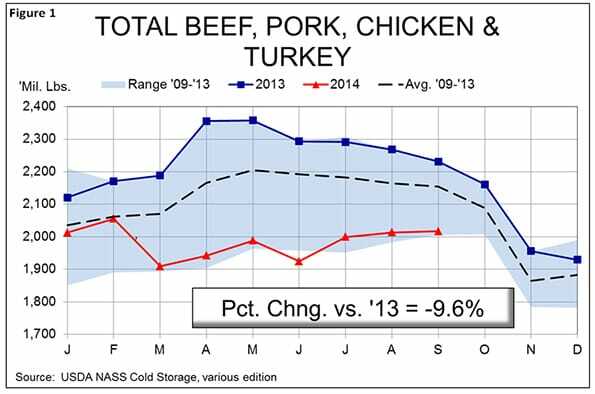 As recently as April 2013, US cold storage facilities held over 510 million pounds of beef, 37 per cent more than in September. The tight beef supply – whether fresh or frozen – situation will not change any time soon. Much-improved pasture conditions and record profits are driving beef cow herd expansion that will keep cows and heifers at home that, in more normal times, would have been moving to feed yards or slaughter plants. Burgers are going to remain pricey. Steaks, too. 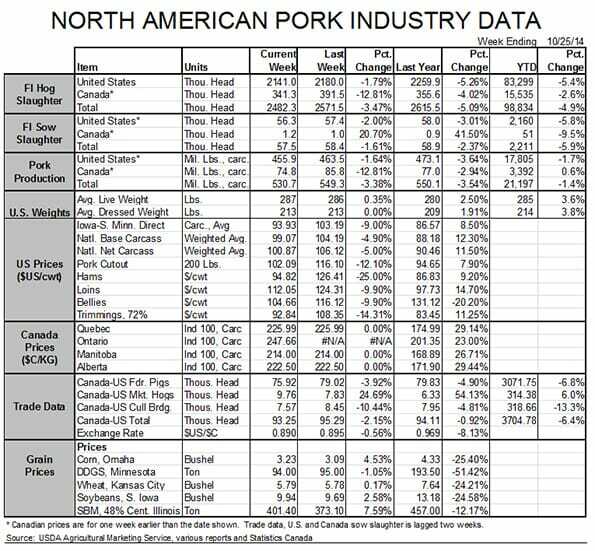 The opportunity for pork, even well-priced pork, to capture market share remains.